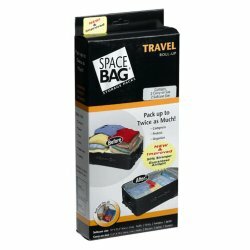 As seen on TV, this space saving plastic storage bag that stores apparel moisture, dust and insect free in much less space! Your vacuum removes air from the bag to save space, reusable. Great for clothing, linens, comforters, blankets, pillows. With your help we can reach more people and let them know about Space Bags whether this product works or not. I'm not sure how anyone was satisfied with these. We bought some of the larger ones and everything that could go wrong did. The zipper seal doesn't stay closed, the bags didn't stay compressed, and the bags even ripped open as if they were made of tissue paper. It's a shame they didn't work because we could definitely use the space. I have several sizes of these bags and I have found that it really depends on what you put in these bags that makes the difference on how much space you will save. When I put giant comforter in the large bag - it works great! When I put jeans and regular cotton clothes - it works, but not nearly as great and not as much room saved. Work Great in Saving Space!!! I bought these from a discount store - you know the one. There were 4 in one box, 1 jumbo, 2 large, 1 medium. I had two plastic underbed storage containers that are like 6" deep. I took one of the large and stuffed that bag full, used my vacuum and then took the other large and used it for the left over items. Trust me - I DOES save space as both plastic containers filled with stuff is now reduced to 2 space savers in ONE!!! Works great!! Horrible. dont save you as much space as they say. plus it broke my vacuum. Not what they advertise. save your money.